Sharing Outlook Calendar, Contacts, Email, Tasks and Notes folders with other Outlook users without a server. Share documents and files. Scheduling. Sharing Free/Busy information. Share Outlook Calendar, Contacts, Tasks and Email between users without a server. If you are looking for a quick and easy way to share and synchronize Microsoft Outlook Folders, as well as to share documents and files, this program is for you. You just need to install ShareO for Microsoft Outlook on your computer running Outlook 2002/2003/2007/2010/2013 and on computers of other users. After a few clicks their folders information will be synchronized each time you update the shared folder on your PC. Your partners will receive the updated Outlook items (contacts, appointments, tasks, emails, notes, journal entries, documents, etc.) via regular e-mail. You will be able to update and manage all your shared Outlook items offline or using any type of Internet connection. It is an easy and effective solution for remote companies and groups. 7 Reasons to Buy ShareO and why it is better than Competitors' Products. Share Microsoft Outlook Calendar, Contacts, Tasks, sharing Email, Journal and Notes. Share Outlook Calendar, Contacts, Inbox, Send items and other folders is easy. Create, edit, and view your friends' or co-workers' meetings, contacts, tasks, e-mails, and documents just as you would do it for yourself. Share Calendar, create your network calendar, share Outlook contacts or selected address books, add shared e-mail folders for support and sales representatives of your company. Synchronize your personal folders: Calendars, Contacts, Tasks, E-mails, Journal, Notes with your second desktop or laptop. Allow your family and co-workers to subscribe (view only) to selected folders. Microsoft Outlook synchronization (sync Outlook) has never been so easy. Create Public Folders without Exchange Server. Create Outlook group calendar, contacts, tasks, e-mail, documents, and notes folders. Sharing Outlook group folders makes easy the group scheduling, handling of tasks, reviewing and coordination of documents, responding to support and sales e-mails, managing customers' contacts. Share Documents and files without file server and e-mail attachments. Drag-and-drop, copy-and-paste documents and any files from any windows folder to any e-mail type Microsoft Outlook folder and share Outlook with your friends and co-workers. Track document changes. Documents and files are "zipped" to save your internet traffic and time. Sharing Outlook folders without Exchange server and Experts. No purchase of new hardware is necessary with our low-cost alternative to Microsoft Exchange Server. No need to hire expensive experts with our Free Online Support. Outlook workgroup share. Scheduling. Outlook Calendar Free/Busy Information Sharing. Share and access your and other users' shared Calendars. 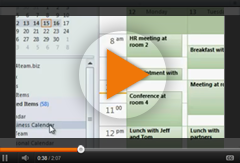 Share Free-Busy time via the Scheduling Tab of the Appointment / Meeting Request. Use Group Schedules in the Microsoft Outlook Calendar folder without Exchange Server. Always know your co-workers' and friends' free/busy time without disclosing the subject and private details. ShareO Security Pack with Military grade security. Microsoft Outlook Custom Forms sharing. Sharing, synchronizing and distributing Outlook custom forms of contacts, appointments, and tasks between computers have never been easy. Especially with different Outlook versions. ShareO allows sharing folders with custom forms in Outlook. The software will automatically publish your custom forms in shared Outlook folders. Microsoft Outlook Net Folders functionality without limitations. NetFolders are Outlook folders that automatically share information from your computer across the Internet. You are not limited to sharing the default Microsoft Outlook item type (Word and Excel documents or any other file type). When you share a folder by using ShareO, a copy of them appears in the Outlook Folder List of everyone who is subscribed to the folder. For example, if you share Outlook folder called "Docs" on your computer, everyone who is subscribed to that folder will have the Docs folder added to their Folder List. Any item you put in the Docs folder on your computer is automatically sent to the Docs folder of all other subscribers. If you modify an item in the Docs folder, the item will be updated in the folder on PCs of all other subscribers. The owner of the shared Folder assigns a simple permission level to each subscriber that determines how they will work with items in the shared Folder. E.g. : the full permission level allows a folder subscriber to add new items or change the existing items. Items changed by subscribers are updated in the original folder and in all folders of other subscribers. Support of Microsoft Outlook 2002, 2003, 2007, 2010, Outlook 2013, Windows 8. The 4Team ShareO plug-in (add-in) for Microsoft Outlook supports the latest Outlook and Windows versions and updates. Workgroupcalendar for Microsoft Outlook Create and view all of your Microsoft Outlook appointments and events in one calendar.